With its CETOP Directory, a buyers' guide, CETOP presents the member companies of the CETOP member associations to a broad audience both in Europe and abroad. 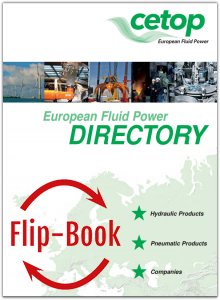 The Directory contains information on the products of over 1,000 companies, both manufacturers and suppliers, in the European fluid-power industry. Hydraulics: hydraulic pumps, hydraulic motors, hydraulic cylinders, hydraulic valves, stand alone electronic devices for use in hydraulics, filters, accumulators, heat exchangers, tubes and hoses incl. assemblies with fittings, fittings and couplings, measuring instrumentation, assemblies, power units, etc. Pneumatics: pneumatic valves, air preparation components, i.e. FRL - filter, regulator, lubricator - and components, fittings and tubes, actuators, measuring instrumentation, vacuum components, stand alone electronic devices for use in pneumatics, etc. Furthermore, information on companies offering courses in education / training in hydraulics as well as courses in education / training in pneumatics is provided. A printed version of this reference work is also available and can be ordered free of charge at the CETOP General Secretariat. Just sent an e-mail to info@cetop.org. Furthermore, this page includes information on universities and technical institutes in Europe, focussed on fluid power.